Step E4 to E5 seems a bit bizarre as H2 gas is released. This would seem to waste ATP but it must be obvious that we should trust evolution which has created this enzyme. Do you think that this reaction would be facilitated by having the hydrides on one Fe ion, Fe6? The mechanism is another classic organometallic reaction, reductive elimination, the reverse of oxidative addition. In this reaction, a molecule is eliminated or expelled from the complex as the metal ion is reduced and adds two electrons. The figure below shows reductive elimination. Reductive elimination occurs most readily in higher oxidation state metal centers which can be stabilized on reduction. It occurs most readily from electron rich ligands and if the other surrounding ligands are bulky. The dissociating species must also be cis to each other as they form a bond to each other when they leave. Oxidative addition and reductive elimination at metal centers are often coupled together in organometallic catalytic cycles with some rearrangement or other modification occurring between them. Think about it. The FeS clusters must return to their original oxidation state after the complete LT cycle. We will encounter another organometallic reaction after the addition of N2, migratory insertion, in the second half of the reaction. Is H2(g) really released? To study this, investigators have used an alternative substrate, acetylene, HC=CH, in the presence of D2 and N2 in an aqueous system. The acetylene was reduced and formed C2H2D2 and C2H3D. Hence E4 must have had 2 Ds in it, and E2 probably 1. These results support the reversible reductive elimination mechanism for the E4 to E4:N2 reaction above. Previously it had been shown the H+ are reduced by D2 in the presence of D2 and N2 in an aqueous system, so these results are consistent. In additional support, deuterium from D2 is not incorporated into products (C2H2D2, C2H3D or HD) in the absence of N2. Let's return for a moment to the bridging hydrides as shown again in the figure below. 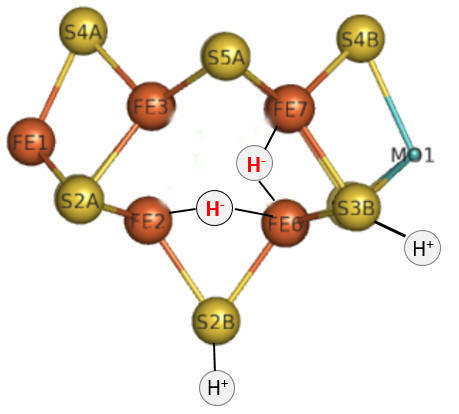 To form H2, the H- hydrides must be protonated. Question 5: The hydrides in the model above are shown as bridging (involved in 3 center, 2 electron bonds) and not as terminal (as shown for the H+). 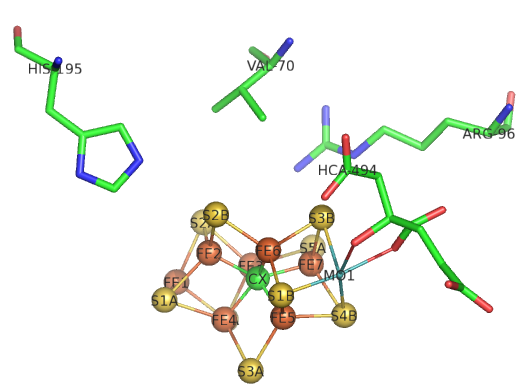 Which would be more resistant to protonation and hence reductive elimination, bridging or terminal hydrides? The bridging hydrides are now stable enough to react with the desired substrate, N2. The M cofactor is large enough to create a face of four Fe ions (see figure below) which are coordinated to a carbide on the bottom face. To create this face of Fe ions requires a cluster of sufficient size with the 6 Fes and 1 central C forming a trigonal prismatic geometry.